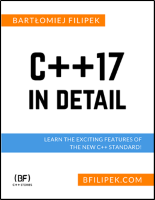 C++17 was officially standardised in December 2017, giving us - developers - a wealth of new features to write better code. This book describes all significant changes in the language and the Standard Library. What's more, it provides a lot of practical examples so you can quickly apply the knowledge to your code.